As a child, I played in my Grandmother’s flower garden, cavorting with the breezes, the colors, and the fertile fantasy life I found therein. My love of color, of flowers, and how those forces can impact one took root there! I’ve carried my love of color forward into my life’s work. 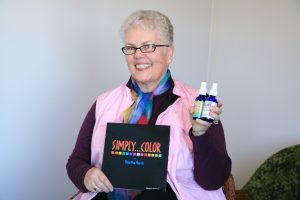 When I started learning about color, I used it to help transform my life, and then the lives of clients. I used color to learn to speak up for myself, to expand and guide my spiritual journey, to overcome past traumas in my life, to soften my own heart and learn how to forgive myself. How? By finding out what colors could boost and repair my energy system. You see, when we have challenges, we deplete the colors that relate to that challenge. We need to replenish color, just like we need to replenish nutrients in our body. For example, the color for speaking one’s truth is blue. So by incorporating more blue into my life, I replenished that color, and I had more energy to speak up for myself. Or, we can have too much of a color and we need to balance it. For example, anyone with an anger problem has an overabundance of red and needs to balance it by using another color. I’ve spent most of my life endeavoring to become a more conscious and more loving person. One of my biggest challenges has been to learn to accept myself. By bringing in the colors related to self-love, such as pinks and magentas, my heart began to open to myself; I became less critical of myself, and I could create self-love. Without color, my life would be so gray and lifeless. My mission is to help raise the consciousness and vibration of this planet, to support myself and others in our healing journeys, and to leave this world a better place when I leave. I have more letters after my name than anyone cares to see, and have studied so many things I would bore you with a list of them. A few things I am certified in are Healing Touch, Reiki, Color Acupuncture, Feng Shui, Aura Soma and many, many others. Presenter at Sheraton Hotels, Life Fitness exercise equipment headquarters, OFS Furniture, Leo Burnett Advertising and various expos nationwide including Conscious Design Expo, 2008. How do I know? I’ve been in all those places. I’ve found solutions that have helped me and hundreds of others. My mission in life is to give to others the wisdom given to and entrusted to me. Solutions and guidance that will enhance your life. Support and acceptance and a warm, safe place in which you can bloom and grow. Who Gets The ‘BEST’ Results With Me? My client base is most often women who are at a crossroads in their lives. Their age group varies but most often they range from 35-70. Sometimes less, sometimes more. They are all at a point where they are willing to take responsibility for their own growth, their own lives. They are committed to making a difference, both for themselves and for those around them. They are creative, super people who are wonderful to work with and ready to make the time commitment and financial investment in themselves. They are honest with me and with themselves: no more hiding, no more fooling around. If this is you, or partly you, we will get on famously! Schedule a reading and from that you and I will select a spray that would support you at this time. Schedule a consultation about what color would best support you and you and I will select a spray that will support you and help you move ahead. I look forward to working with you and helping you attain YOUR Life’s Potential!